ASR X-04A/ 07A is the one for very small diameter materials. This type is equipped with our original A.T.C system (Automatic Top Catch system) (PAT.P) as standard. Following ability of very small diameter materials has been improved owing to servo motor. This type realizes unmanned continuous machining for 48 hours. The rack has capacity of 500 pcs of φ1mm material. There is no need to align very small diameter materials since materials are stocked in bundled forms. Adopting precise synchro device and the quantitative control achieved by servo motor reduce stress on materials and prevent whirling while machining. Also weight and torque adjustment is unnecessary. This is short type feeder equipped with new shift device (PAT.P) and it is possible to save and utilize floor space. This is the fully covered genuine bar feeder for very small diameter materials. *Specification may be changed without notice for improvement. 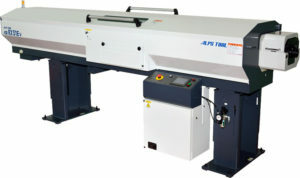 AZ12X is improved version of ASR X-2Z which was made for small diameter CNC automatic lathes. This type is newly designed and better in quality and efficiency. Torque and speed are precisely controlled by servo motor. This type has better performance and durability owing to linear slide. This type can follow the movement of high speed spindle on lathes owing to new synchro device. New support prevents noise and vibration. this type is equipped with energy-saving oil pomp and remnant can be extracted from both sides. Data setting and maintenance can be easily done with the touch panel. 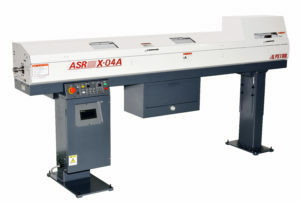 ASR X-20ZⅡ is cutting edge oil type bar feeder for small and medium diameter automatic lathe. This is improved version of ASR X-16Z and the upper cover can be opened and closed from both sides same as RX type. This type occupy 10% less floor than former model and realize easier and stabler operation. The upper cover can be opened and closed from both sides and it allows you to replenish material on the rack from both sides. The touch panel makes programming and maintenance easier. New durable synchro device (OP) can be equipped. This type has shorter structure and occupy 10% less floor. Rack capacity has been increased by 10%. 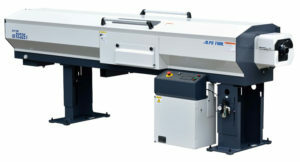 ASR RX32Ev is the latest model for medium and large diameter CNC lathes. This model is designed to realize higher rotation performance and quieter factory environment based on our original technology. This type adopts multi-hybrid support that improves a fluid characteristic of oil and vibration control. Furthermore, a steady rest unit which realizes less noise and vibration is equipped on the top end as standard. This model is the high performance oil type bar feeder that achieves certain stability at high speed and safety. Set-up change is finished only by swapping finger chucks and adjustment. Double-feed rods (PAT) improve vibration control in the main spindle. Accurate remnant discharge (PAT.P) realizes stable continuous operation. servo motor realizes stable feeding control. Surplus materials can be automatically placed on the rack after the machining. The upper cover can be opened and closed from both sides and set-up change and maintenance can be done easier. ASR RX45Ev/ RX51Ev are the latest model for medium and large diameter CNC lathes. This model is designed to realize higher rotation performance and quieter factory environment based on our original technology. This type adopts multi-hybrid support that improves a fluid characteristic of oil and vibration control. Furthermore, a steady rest unit which realizes less noise and vibration is equipped on the top end as standard. This model is the high performance oil type bar feeder that achieves certain stability at high speed and safety. ASR X-65EV is the latest magazine oil type bar feeder designed for medium and large diameter materials based on our accumulated techment on fluid characteristic of oil, high rigid bush type rotation control device, and thnology and achievements. New hydrodynamic support which achieves further improvee middle support device help machining of medium and large material. This model is suitable for wide range of bar diameter from φ8 to φ60 (65) mm and hexagonal bar materials from H10 to H46 mm. The upper cover can be opened and closed from both sides. Servo motor realizes further improved feeding performance. Set up change is finished only by swapping finger chucks and adjustment.